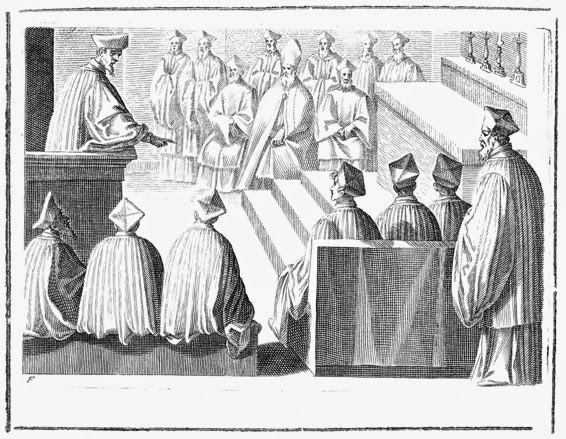 For the current Synod on the Young People, the Faith and Vocational Discernment, we are reprinting from 2015 the traditional order for holding a synod, according to the 1595 Pontifical of Clement VIII, both as a matter of general interest, and as something which will perhaps serve to inspire prayers for the good outcome of the current assembly. It is divided into three days, and seems to presume that much of the Synod’s business will be determined by the bishop and his assistants beforehand. The rubrics are given here in summary, omitting several of the less pertinent details, such as the places where the bishop removes his miter etc. Bending the knee of our hearts before Thee, o Lord, we ask that we may accomplish the good which Thou seekest of us; namely, that we may walk with Thee, ready in solicitude, and do judgment with most careful discretion; and with love of mercy, shine forth in our zeal for all that pleaseth Thee. Through Christ our Lord. Let us pray. Kindly pour forth upon our minds, we beseech Thee, o Lord, the Holy Spirit; so that we, gathered in Thy name, may in all things hold to justice, ruled by piety, in such wise that here our will agree with Thee entirely; and ever pondering on reasonable things, we may accomplish what is pleasing to Thee in word and deed. Through our Lord Jesus Christ etc. This prayer is a cento of the first collect of the Ember Saturday of Pentecost, the first prayer of the preceding day of the synod, and the collect of the Sixth Sunday after Epiphany. The previous day the Litany of the Saints was said at this point; it is not repeated today. The bishop now sings, “Oremus”, the deacon “Flectamus genua”, and the subdeacon, after a pause, “Levate”, after which the bishop sings this prayer. O God, who command that we speak justice, and judge what it right; grant that no iniquity be found in our mouth, no wickedness in our mind; so that purer speech may agree with pure heart, justice be shown in our work, no guile appear in our speech, and truth come forth from our heart. Through our Lord Jesus Christ etc. The deacon then sings the following Gospel, Luke 10, 1-9, the common Gospel of Evangelists (and some Confessors), with the normal ceremonies of a Pontifical Mass. At that time: The Lord appointed also other seventy-two: and He sent them two and two before His face into every city and place whither He himself was to come. And He said to them: The harvest indeed is great, but the laborers are few. Pray ye therefore the Lord of the harvest, that he send laborers into his harvest. Go: Behold I send you as lambs among wolves. Carry neither purse, nor scrip, nor shoes; and salute no man by the way. Into whatsoever house you enter, first say: Peace be to this house. And if the son of peace be there, your peace shall rest upon him; but if not, it shall return to you. And in the same house, remain, eating and drinking such things as they have: for the laborer is worthy of his hire. Remove not from house to house. And into what city soever you enter, and they receive you, eat such things as are set before you. And heal the sick that are therein, and say to them: The kingdom of God is come nigh unto you. As on the previous day, the bishop kneels to intone the hymn Veni Creator Spiritus, which is continued by the choir, after which he sits at a chair which is set up facing the assembly, and addresses it. At the corresponding point the previous day, a brief model for his address is given; the rubric of this days specifies that he speaks “his verbis – with these words,” but also says that he may omit them. My venerable and most beloved brethren, just as we reminded your kindness and gentility yesterday, concerning the divine offices, and the sacred grades of (service at) the altar, or even (our own) mores and the needs of the Church, it is necessary that the charity of all of you, whensoever it knoweth of any matter in need of correction, hesitate not to bring forth in our midst such matters for emendation or renewal; that by the zeal of your charity, and the gift of the Lord, all such matters may come to the best, to the praise and glory of the name of our Lord Jesus Christ. As on the previous day, before or after the bishop’s address, a “learned and suitable man” delivers a sermon “on ecclesiastical discipline” and other matters “as the bishop may determine”. The archdeacon then reads any Apostolic Constitutions which may not have been promulgated hitherto in that place, and other such documents, as the bishop may decide. There are then read out the constitutions put forth for the approval of the synod, which are then voted upon. (One must assume that in accordance with local traditions, various other matters may also be dealt with.) The bishop then gives the Pontifical blessing, and all depart.